This is a tale I have been waiting to tell for a while. Regular readers will know that in 1910 Professor Robert Williams Wood, of Johns Hopkins University in Baltimore USA, published an infrared landscape photograph. The Midwinter Number of the Century Illustrated Monthly Magazine, priced at 35 cents, appeared in February 1910. 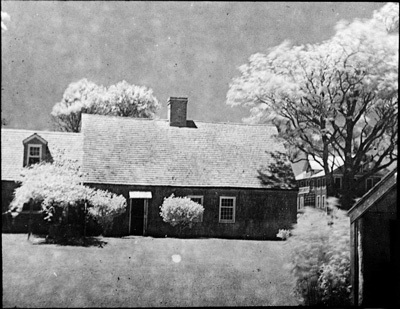 In this was an article by Wood called A New Departure in Photography, which included an infrared photograph of his summer home in East Hampton. As far as I know this was the first infrared photograph (as distinct from a spectrograph) to be published. Later that year Wood presented his seminal paper on photography by Invisible Rays to the RPS in London and then went off to Italy. While in Italy he took more infrared photographs, many of which were published in the Illustrated London News in June 1911. I had thought that Wood's actual photographs from this time were lost, despite the set from his RPS lecture being made available for hire from famous slide dealers Newton of Museum Street, London. So the ILN printed versions were the only ones available. Surprisingly I came across a web page from Chris Fastie. His late father was a contemporary of Wood's at Johns Hopkins and had been given some slides, large format 'lantern' slides, of Wood's infrared photographs. These included some from the Italian trip, but also included one labelled 'First infra-red photograph' which showed another view of the East Hampton house. So this claims to be the first infrared photograph; different from the first one published. There isn't a date on it unless that is part of the missing text (could that be revealed under infrared light I wonder). Wood's biography refers to the first photograph being of 'distant hazy' mountains taken in 1908 but this would seem to be a label, probably written by Wood himself, contradicting that. Definitive? You can read a more detailed account on Chris's web page here. The house was (and apparently still is) on Apaquogue Road and he was famous enough for there to have been a postcard produced, early in the 20th century, showing the 'Home of Prof RW Wood, East Hampton LI'. You can see it here, as part of a book of old postcards of East Hampton by Richard Barons and Isabel Carmichael and from the collection of the East Hampton Historical Society. At this time I contacted Professor Paul Feldman at Johns Hopkins (he took part in our symposium in London back in 2010) and told him about this discovery. It turns out that Chris Fastie's father Bill was Paul's mentor at JHU and they all know each other. Then, Paul decided to take a look in what he called 'the attic' in the Physics department and found some more slides. These look to be others from the same set but,as they don't include the 'moon cave' image published in the ILN, it is possible there are more out there.